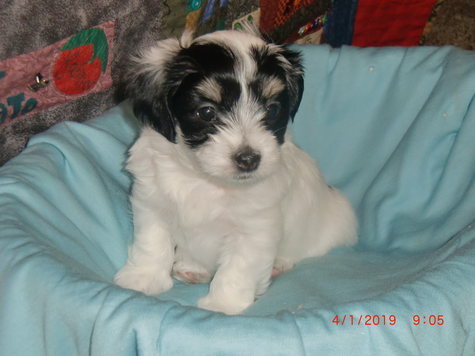 3 Male Havanese puppies for sale beginning April 17th. 2 white with black spots, 1 white with brown spots and green eyes. Purepred, from AKC registered father, and mother from the same breeder. Very sweet, non-shedding dogs who are smart, cute, great for families with kids, the elderly, or anyone. Known as Velcro dogs for how they like to stick by you. Raised in a clean smoke-free home by loving owners.